Freecool® by Workspace Technology is an award-winning cooling system which offers significant energy savings when compared to traditional DX cooling technology when deployed in data centre, industrial and commercial building environments. Freecool® evaporative cooling system technology makes the use of the outside air to cool data centre or computer room environments. 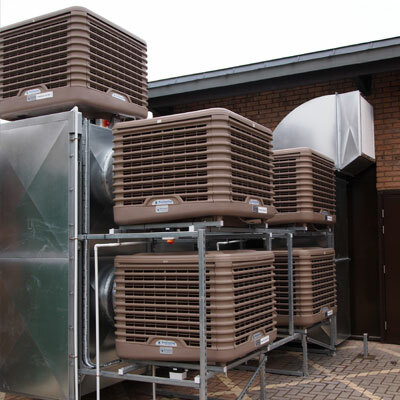 However, unlike simple air economisers which require supplemental DX or chilled water cooling when external ambient temperatures exceed 21ºc, Freecool® engages the evaporative cooling system which reduces actual external air temperature by simply passing the airflow through wet filter pads. Freecool® offers clients a choice of direct and indirect airflow configurations. Workspace Technology’s range of direct Freecool® Evaporative Cooling Systems deliver innovative low energy cooling for data centre environments typically delivering PUE figures of <1.15. Freecool® installations are designed and built from scalable standardised modules that can be interconnected in a bespoke arrangement supporting ‘real world’ client applications. Freecool® Evaporative Cooling Systems deliver significant technical advantage over factory built single chassis alternatives that are very often cumbersome, expensive and difficult to deploy in many applications. Workspace Technology’s Freecool® can be installed as part of a new data centre or can be retrofitted and configured to work in harmony with existing cooling technology. Supporting rack densities from 1kW to 20kW Freecool® has become the preferred cooling technology for many public sector and corporate organisations. Workspace Technology also provides indirect ‘closed loop’ energy efficient free cooling for larger data centre environments using the industry leading Excool product. The Excool system is indirect utilising state-of-the-art ‘heat exchange’ technology which harnesses the cooling effect of air and water. The heat exchange technology has been developed specifically for this process. If the outdoor air temperature becomes too warm the integrated control system starts the adiabatic process which reduces the outdoor air temperature entering the heat exchanger. This system will support equipment inlet temperatures of 24ºc, 365 days a year within most of Northern Europe. The golden rule of energy efficiency technology deployment is to ensure that the savings are greater than the costs. Due to the exceptional energy savings that Freecool® Evaporative Cooling System will make, the return on investment is typically 18 to 36 months*. Over the predicted minimum 15-year life of the system it is projected that Freecool® Evaporative Cooling System will payback multiples of the initial investment. * Payback periods will depend on the complexity of the installation and the cooling load. In addition to our award winning Freecool® Evaporative Cooling System we also offer an array additional data centre cooling systems. Contact our team today to find out how Freecool® Evaporative Cooling Systems can save you money and reduce your carbon footprint whilst ensuring your data centre infrastructure’s temperature is maintained.